What is with the name Audiocadabra? 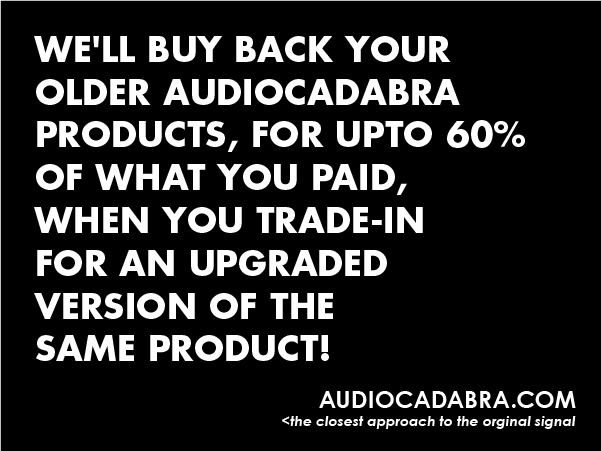 Audiocadabra™ has been inspired from the word—Abracadabra. There are actually no magic spells here, these are very well engineered products that has resulted from careful evaluation of the balance between performance and penalties that every cable design is subject to. The result is a sonic neutrality and transparency that will allow you to hear how great your audio system actually sounds. Since these simple looking cables don’t look like, sound constricted like or cost as much as typical designer/branded cables, they are called Audiocadabra™. They will help unleash the hidden performance in your audio system. Audiocadabra™ cables may appear like the closest approach to a naked wire but they actually sound like the closest approach to the original signal! Are machine-made cables better than handcrafted cables? A machine made cable is basically made from start to finish by a machine or mechanical device. 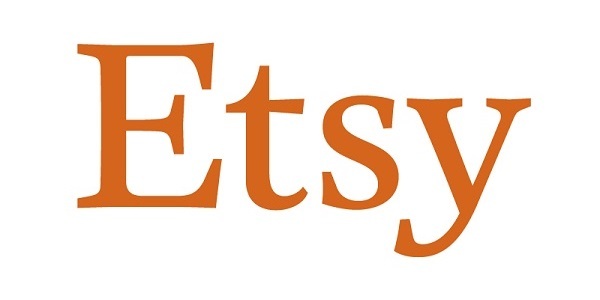 The major benefit is that the product can be made quickly compared to its handmade version. Every product will be very close to being identical. Cheaper prices coupled with high demand have increased mass production from countries such as China and Taiwan to cater for the customer. Automated cable-making equipment offers consistency but it limits the choice of materials and geometries used—thereby reducing the effectiveness of the cable designs. The outcome is a cable that sounds like every other mass-produced cable anywhere on the planet. They don’t handcraft cables like us anymore! The unique art in modern times is a lot more labour intensive and generally associated with high end cables. Countries known for their handmade cables include Italy, England, France and Germany. Basically, someone is creating and assembling a product by hand. There is a huge focus on care and delivering the best cable—the perfect design, the right color, the best material and so on. No two handmade cables are identical. Why? Minor differences and a mastered technique by an individual in producing each product have a unique effect. With so much attention put into these cables they tend to last much longer and perform better over time. This is the real beauty and real value of being handcrafted. Because Audiocadabra™ cables are handcrafted, we’re not limited by the constraints of automation technology, or by the materials we use. 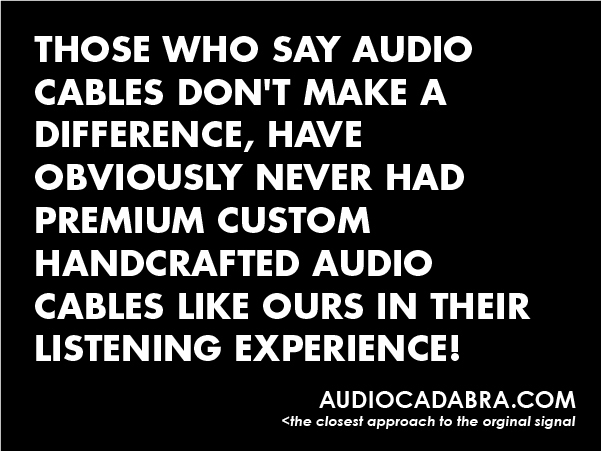 All Audiocadabra™ cables are proudly and meticulously handcrafted in India since 2005. What sets Audiocadabra apart from competition? Every audio cable design is a balance of performance and penalties! We believe that a good cable can’t improve the original signal; it can only avoid making it worse. Very good cables are simply the ones that get out of the way of the signal flow. We pay attention to every component used in our cables including conductors, dielectrics, designs, braids, tools and terminations used. Our nonconformist approach and technique to cable making has enabled us to craft the most open and transparent sounding cables that are true to our motto—the closest approach to the original signal! Brass is an alloy with 70% copper in it along with 30% zinc, the conductivity of brass is only about 28% IACS, that of pure Gold is 70% IACS, that of pure copper is 100% IACS and that of pure silver is 105% IACS. Brass is an ideal choice for connectors/contacts, in the electrical industry, only because they are cost effective, have excellent machinability and they do not wear out easily with repeated use and abuse, unlike copper and silver that are pliable, when in a pure form. Some of our premium products, such as the Optimus Ultra and Ultimus Ultra cables, have no brass contacts, no nickel plating, no PVC/plastic sheathing and no solder too. This is what sets our brand apart from the majority of the mass-produced, fancy-looking and high-priced competing brands found in the market today. Most of the tools and parts we use to craft our products are actually hand-picked and imported from around the world from well-known brands. The quality of soldering and techniques we use are second to none. The difference is clearly audible in a good audio system! 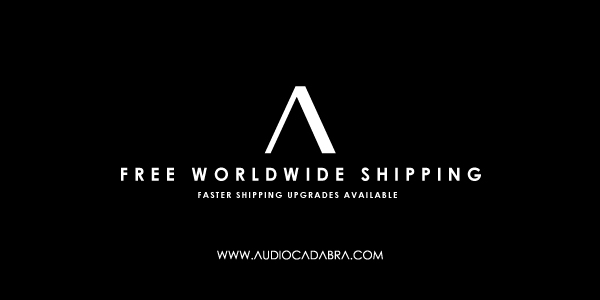 Every Audiocadabra cable takes at least 04 hours to craft and if you were to buy a similar handcrafted audio cables, with so much of attention to detail and care, from the US, Japan or Europe you will see the difference in price but not in quality. 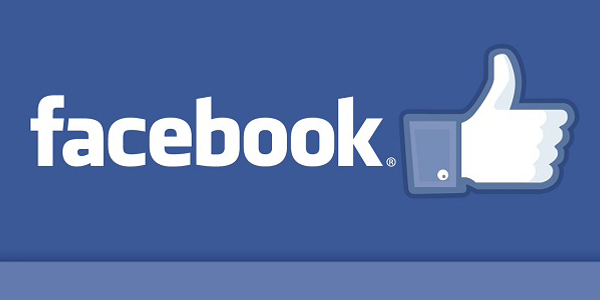 We aim to be a high-value brand and not a high-priced brand! Since we custom manufacture our own wires and connectors we do have a price advantage over competition. 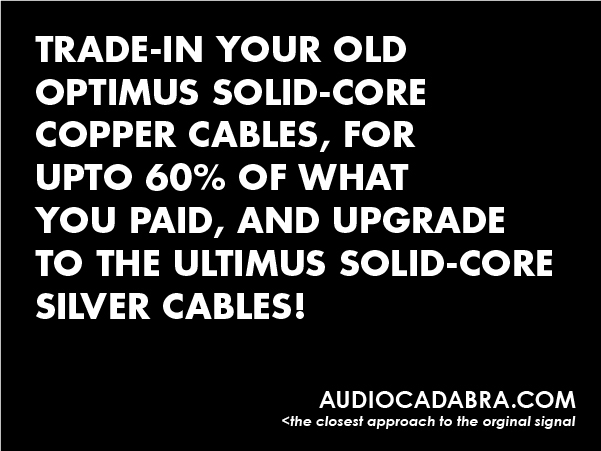 The Audiocadabra Ultimus Solid-Core Silver Cables are probably the most low-priced solid-core silver cables in the world. Our prices are almost as good as any OEM. We know of no other cable brand that uses similarly sized pure solid-core silver conductors, of this quality, at these affordable prices! Polytetrafluoroethylene (PTFE) is a synthetic fluoropolymer of tetrafluoroethylene that has numerous applications. The best known brand name of PTFE is Teflon by DuPont Co. It is commonly believed that Teflon is a spin-off product from NASA space projects. Although it has been used by NASA, the assumption is incorrect. PTFE was accidentally discovered in 1938 by Roy Plunkett, in New Jersey while he was working for Kinetic Chemicals. As Plunkett was attempting to make a new chlorofluorocarbon refrigerant, the tetrafluoroethylene gas in its pressure bottle stopped flowing before the bottle’s weight had dropped to the point signalling “empty.” Since Plunkett was measuring the amount of gas used by weighing the bottle, he became curious as to the source of the weight, and finally resorted to sawing the bottle apart. Inside, he found it coated with a waxy white material which was oddly slippery. Analysis of the material showed that it was polymerized perfluoroethylene, with the iron from the inside of the container having acted as a catalyst at high pressure. Kinetic Chemicals patented the new fluorinated plastic (analogous to the already known polyethylene) in 1941, and registered the Teflon trademark in 1945. PTFE is a very stable, high-performing insulator with a low dielectric constant. It provides excellent mechanical properties and a consistent level of detail and clarity above other dielectrics that we’ve tested. What is Dielectric Effect Distortion? When current flows thru a wire, it creates a magnet field around the wire. With music traveling thru a wire, this magnetic field will expand and contract around the wire just as a woofer moves in and out when playing music. This magnetic field is constantly cutting thru whatever material is surrounding the wire. All cables are made of a conductor (the wire) surrounded by an insulator (the jacketing). Another name for the insulating material is “dielectric material”. Various materials have their associated Dielectric Coefficient Number. The number represents how much dielectric effect that material has. For example: Cotton is 1.3 -1.4, Polypropylene is 1.5, PTFE also known as Teflon is 2.0, and PVC Plastic is 3.5 – 4.5. The higher the number the greater the dielectric effect. All values are nominalized to “Air” which has a dielectric coefficient number “1″ because it has virtually no dielectric effect. When the music signal flows thru a cable, the dielectric material (insulation) around the wire absorbs some if this magnetic energy, but then re-releases it back into the wire slightly later in time. This time smearing of the music signal is called dielectric effect distortion. 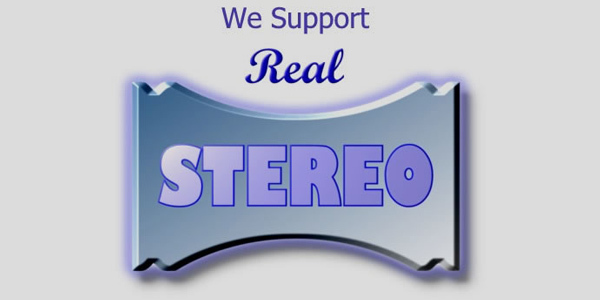 This type of distortion collapses the sound stage, makes the music sound hard and closed in, and reduces dynamics making the music sound lifeless and un-involving. Obviously, using insulating materials with a higher dielectric coefficient number causes more of this distortion. Also, since this is an accumulative effect, the thicker the insulating material and the longer the cable, the more dielectric effect distortion, the worse it sounds. The Audiocadabra™ cables use proprietary wires that use a thin yet durable Polytetrafluoroethylene (PTFE—the best known brand name of PTFE is Teflon by DuPont Co.) coating to insulate the copper conductors. Beyond this sheathing, there is nothing left but air, and air is a near ideal insulation dielectric material because it causes virtually no dielectric effect distortion. Almost all audio cables are screened, which means that an outer conductor wraps around the other conductor(s) to shield them from electromagnetic interference. The outer screen, which may be made of wire braid, metal foil or conductive plastic, is usually connected to ground so that any induced currents (due to interference) flow directly to ground rather than being allowed to modulate the audio signal. However, screening isn’t a perfect solution. Careful auditioning and objective measurements indicate that tremendous interactions occur between the signal carrying portions of a cable and the overlying metallic shield that is utilized in most cable designs. External shielding is the easiest way to prevent noise propagation, but this technique is clearly not the best approach when trying to optimize such sonic characteristics as speed, openness, and depth of presentation. 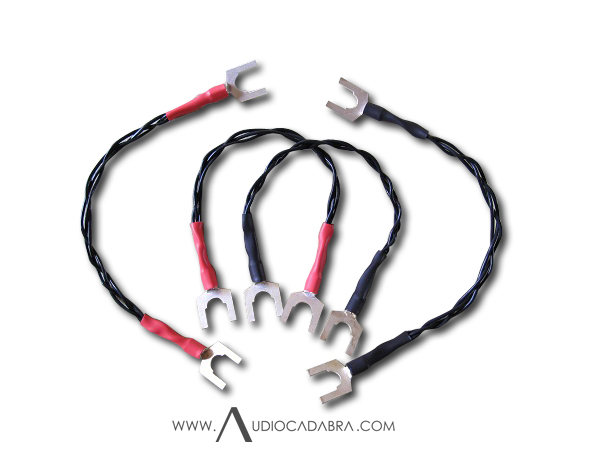 Audiocadabra™ cable designs have been optimized to deliver excellent RFI/EMI noise resistance without the use of external shielding—it’s all in the handcrafted cable braid! Our unique hand-braided cable constructions are an ideal balance of RFI/EMI noise resistance and flexibility. Dielectric effect distortion (as explained above) is particularly bad when the dielectric material is unconditioned, meaning it has not been exposed to electrical signals. With use, the dielectric material becomes conditioned, the dielectric effect distortion becomes less, and the cable or component gets better sounding. 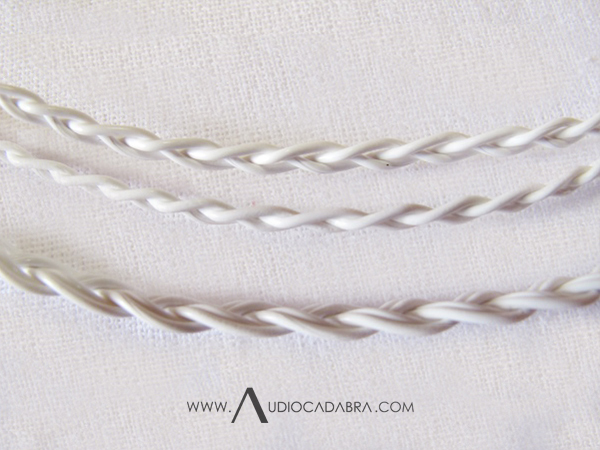 Audiocadabra™ cables have very little dielectric material surrounding it, so there is less to break-in. Most people think that Audiocadabra™ cables sound great right out of the box, yet others report they get better with time. 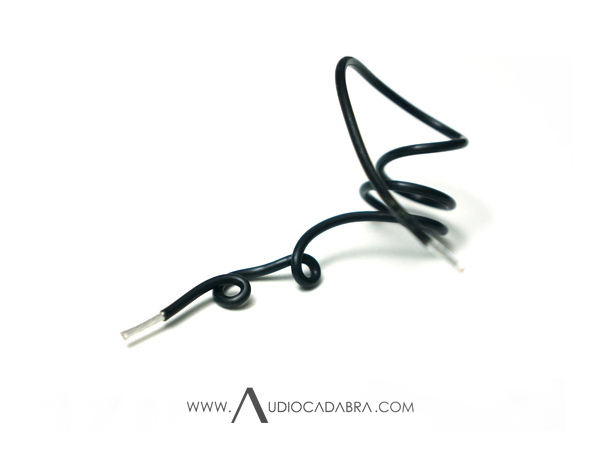 Once you get about 100 hours on the Audiocadabra™ speaker cables, you can consider them quite broken-in. The Audiocadabra™ interconnects may take about 200 hours and the Ultimus interconnects, that uses 99.99% pure solid-core silver conductors, may take as long as 400 hours to break-in, depending on the cable model and frequency/duration of usage; this is simply because interconnects carry much smaller signals with much less current so it takes more time to condition them. The 14 days risk-free trial should give you sufficient time to allow Audiocadabra™ cables to break-in and settle-in your audio system. An easy and quick way to break-in the cables is to simply hook them up to a tuner or other line level component and let them run continuously for several days non-stop. During break-in, expect these handcrafted cables to sound exciting at times and dull at certain other times. Post break-in, expect a neutral spectral balance atypical of cables at this price point without any loss of details and accuracy. If you get accustomed to the spectral balance of these efficiently designed and meticulously handcrafted cables, you may also be able to gauge how other cables are colored or tipped depending on their respective ‘performance to penalty’ ratio that each and every cable design is prone to. 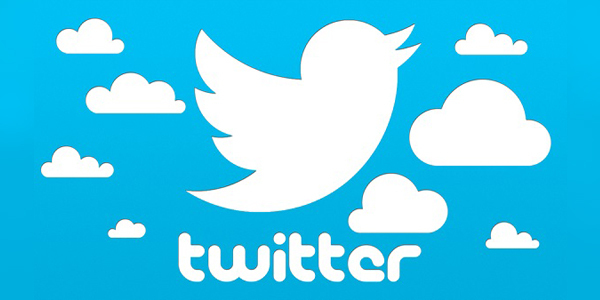 If you still have more questions, kindly contact us and we are more than happy to assist you.